Everyone knows the American shopping mall is dead. The huge department stores that once anchored the nation’s malls are closed or closing. So are many of the chain stores that used to line the mall corridors between those anchor stores. The consumers who once thronged those corridors now shop from the comfort of their homes, lured by the convenience, pricing and inventory of online services, some offered by those same brick-and-mortar retailers. In some places, entire malls stand vacant. One investment bank says 200 American malls will be bulldozed by 2022. ... Try finding a parking place during the holiday season at the region’s shopping malls. Check out the crowds at popular retailers like the Apple store, or whenever a popular, of-the-moment retailer opens a new location. Perhaps the two biggest validations that there’s life remaining in American shopping malls are that the online retailers, those widely credited with the demise of the mall and its traditional tenants, are themselves now opening brick-and-mortar stores in shopping malls, and that property owners are pouring millions into malls, and not just for a new coat of paint or shiny planters. The American mall “is going to live on, but it’s going to look very different from what it looks like today,” says Marcie Merriman, executive director for growth strategy and retail innovation with Ernst & Young in Columbus, Ohio. The transformation is already well underway at properties in the Seattle area. Simon Property Group, the largest shopping mall operator in the United State, plans a dramatic remaking of Northgate Mall in North Seattle. One of the region’s oldest, it will still be a shopping mall, although retail space could be trimmed from close to 1 million square feet now to 500,000 to 700,000 square feet in the new configuration. Added to that, however, will be several hundred units of housing, 500,000 to 750,000 square feet of Class A office space and a hotel. In the south end of the Puget Sound region, Simon is taking space at Tacoma Mall occupied by a Sears store designated for closing and replacing it with several buildings to hold smaller retail tenants and a new movie theater. Considered one of the nation’s most successful retail properties, Kemper Development's Bellevue Square and the adjoining and connected Lincoln Square and Bellevue Place (marketed jointly as The Bellevue Connection) have grown to more than 5 million square feet of retail, office, hotel, entertainment, dining and residence space. Toward a mall and the right visitors: When it opened in 1950, Northgate Mall was suburban in concept even though it sat inside Seattle city limits. Its owner, Simon Property Group, plans a "reimagining" that will coincide with the arrival of a Northgate light-rail station, changing the mall's footprint from the traditional, above, to a more urban center encompassing retail, residential and office space, below. Perhaps the most dramatic remake of a retail property can be found in Kirkland, home of the former Totem Lake Mall. A relatively nondescript 35-year-old property is being transformed into the Village at Totem Lake, a mixed-use development designed to combine all the elements of a small town and a suburban mall in one property. In a 40-year career in retail development, Bruning has seen the life cycle of the American mall. He’s a former real estate director for Sears and helped negotiate leases for that once-dominant retailer’s locations at Southcenter, Alderwood and Tacoma. The mall, especially a big regional development of the type that would be anchored by a Sears and other department stores like The Bon Marché (now Macy’s) or Frederick & Nelson, replaced the tired, dowdy downtown business districts with a variety of stores in one place and acres of free parking. A lack of reinvestment wasn’t the only problem malls built in the ’50s, ’60s and ’70s encountered in the 2000s. The United States built far more retail space per consumer than anywhere else. Then came the internet. Interestingly, those in the business don’t put nearly as much blame on it as conventional thinking might suggest, but with online shopping duplicating much of what could be found at the mall, those properties lost a compelling draw to pull people out of their homes and into their buildings. The obvious answer is to remake malls into true community hubs and social centers, far more than they were when they were the shopping district of the suburbs. That’s the plan CenterCal Properties, which bought Totem Lake in 2016, is trying. Most of the existing structure is gone. 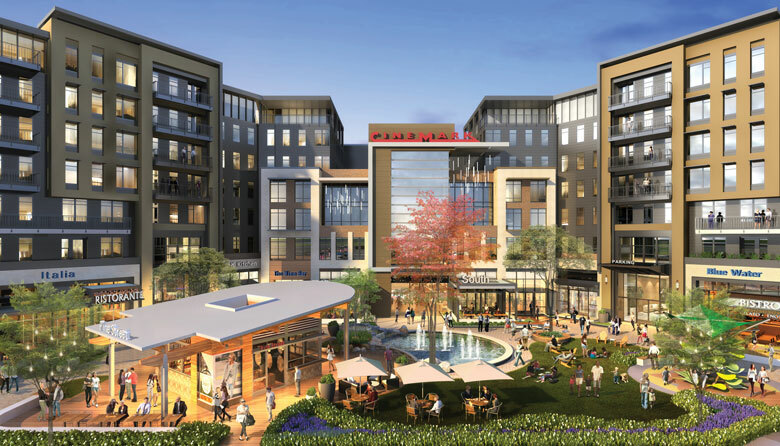 In its place, CenterCal, whose holdings also include malls in Silverdale and Union Gap, is building offices, 850 luxury apartments, restaurants and movie theaters, constructed around a central plaza/park/public space that people will, theoretically, want to congregate in. And yes, even in the internet era, retailing is still an important component, although its share may decline (at the new Totem Lake, the retail square footage will be about half that in the old mall). The two complement each other. Buzz about a new product on the internet, he explains, results in increased traffic in the store. People may do their research online, but many of them want to see what they’re buying firsthand. Retailers not prepared for these new shoppers will suffer. “We can still screw it up with the customer right in front of us if we’re not on our game,” Freeman warns. “People being social animals, they like to shop, and they like to be with other people,” Bruning adds. They want shopping to be “experiential,” whether that means entertainment or a wine bar. There’s a bottom-line component to the synergies of physical and online retailing as well; stores that are demonstration sites or places for customers to order, pick up or return merchandise often entice patrons to make additional purchases while there. The malls at which they shop will look markedly different from those built in past decades. Many will be true mixed-used properties, with offices and residences onsite, creating self-contained villages. Parking won’t get as much emphasis. Simon is looking to tie in Northgate to a planned light rail station; the Village at Totem Lake is next to EvergreenHealth Medical Center and its hospital-office complex; Bruning hopes his development will appeal to those looking to walk or bike to work. The mix of tenants will change and expand to include types and uses rarely seen in malls before. Tesla drew lines of people looking to order cars when it opened a showroom in Bellevue Square. Fresh food and groceries as a category of mall tenant has waxed and waned through the years; Bellevue Square and Tacoma Mall both had grocery stores in their earliest days, and prepared foods is a growing category. The former Mervyn’s space at Westfield Southcenter in Tukwila is now a Seafood City Supermarket, specializing in Filipino and other Asian goods. Gyms, fitness centers and high-end spas are appearing frequently. And online retailers will expand their brand presence and marketing reach with brick-and-mortar stores, as Amazon has done with bookstores and its purchase of Whole Foods. Bruning predicts Amazon will be one of the largest physical-store retailers in the next 15 years. What constitutes a mall, anyway? Your handy guide to shopping-center identification. Is there a difference between malls and shopping centers? The International Council of Shopping Centers (ICSC) says there is indeed. It has no fewer than five classifications of general-purpose shopping centers in the United States. • Strip/convenience centers are the smallest and most prevalent type, typified by a row of small storefronts anchored by a convenience store. • Neighborhood centers are convenience oriented, usually anchored by a supermarket. • Large neighborhood centers tend to be anchored by discount stores, supermarkets or “large specialty discount stores” (toys, books, electronics, home improvement/furnishings or sporting goods, etc.). • Regional malls, up to 800,000 square feet, are “enclosed with inward-facing stores connected by a common walkway,” with full-line or junior department stores as anchors. • Super-regional malls are similar in concept to regional malls but offer more variety and assortment and are usually larger than 800,000 square feet. Bellevue Square, above, is an example. The ICSC also has categories for "specialized-purpose centers," including power centers, lifestyle centers, factory-outlet malls and theme/festival centers. Add airport retail and you get nearly 116,000 shopping centers in the United States and 7.6 billion square feet of gross leasable area.